A proud son has attended the unveiling of a memorial which he raised more than £4,000 towards in memory of his father. Graham Campbell of Wellingborough lost his father in 2017 and decided to do something special in his memory. As his dad Neil was very proud to have served for The Kings Own Yorkshire Light Infantry, Graham held a Spring ball at Wellingborough’s Glamis Hall to raise funds for the regimental association. His efforts resulted in £4,100 being raised towards a memorial, which was unveiled earlier this month. Graham said: “We were privileged to attend the KOYLI memorial unveiling on August 1 in Doncaster. A standard bearer from the association had attended Neil’s funeral last year and escorted his coffin into the service. They wouldn’t take any payment on the day, saying they were honoured to be present, but Graham then discovered they were trying to raise £160,000 for a memorial they were having made so Graham decided to support this. The official unveiling and memorial service was attended by many ex-KOYLI service personnel along with family at Elmfield Park followed by a reception lunch at Doncaster racecourse. Brigadier Roger Preston CBE unveiled the memorial in the presence of invited guests including KOYLI veterans, families, civic dignitaries from the Regimental Freedom towns and military representatives from the 8 Rifles, the successors of the KOYLI and Light Infantry. And Graham added: “The perfect end to the day was having a conversation with Brigadier Preston about when he and my father served together. “It was great seeing so many ex-serving personnel remembering all the times they spent together. “Major David Wroe has done a fantastic job in organising three years of fundraising to achieve the £160,000 needed to purchase the memorial. 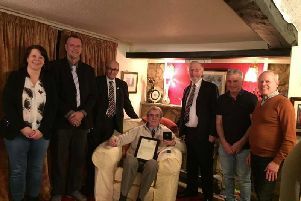 “He made a speech and thanked everyone immensely on behalf of the association who contributed to our fundraising efforts in achieving the final amount of £4,100. “Thank you so much for all your support of the Spring ball fundraiser. “I am so pleased to have raised so much for this good cause. Neil was a proud Yorkshireman but had lived in Wellingborough since 1972 after moving up as part of the London overspill. Despite suffering a stroke at the age of 59, he loved going to Glamis Hall three days a week and celebrated his 80th birthday with a party at the hall on the Queensway estate.